I am in a wonderfully great mood, not really sure why and how long it will last for so i thought i would embrace the moment he he! I have just decided to purchase the new Red Velvet E-course, about elsie and emma’s dream job, it is a step by step course for starting and developing your own voice in business. I am so excited about this because i can now have the confidence and advice to get things started. So as of today that is my focus and to get my dream up and running, i have decided that i want to re-brand RubyRaeLove and my blog so i will be working most of the hours god sends me saving and creating inspiring and great things. I have new ideas and features for my Blog. I can't wait to see what you come up with, and thats such a beautiful illustration! AHHHH this post made me smile, I am so glad you are going for your dream (loool cheesy line there Rose) but it's true! do what you have to do to make it happen. Ah i woudl so love to own a little shop and of course a tea room next to it..Imagine how nice that would be! and the tea of course hehe. the drawing's amazing too, I can never ever draw bicycles! very jel. That sounds like such a great dream! I can't wait to hear about it when you finally do it. It definitely sounds like the sort of place I'd love to visit! Can I work in your shop, PLEASE?! It sounds perfect. I love Elsie's blog and she's definitely got an inspiring life. Good luck rebranding! 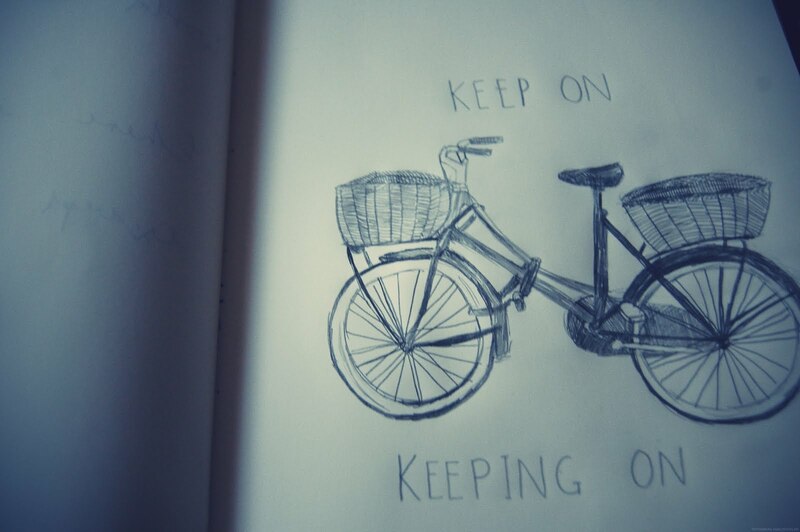 I love bicycle drawings, for some strange reason. Maybe it's all those simple shapes combined together to make machinery? Nicely done! I like the type, too.